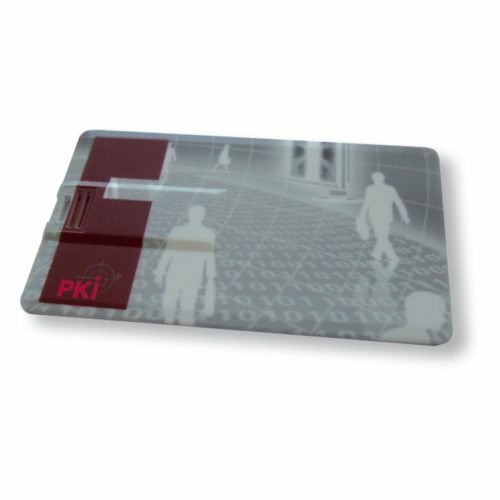 This contactless (RFID = Radio Frequency Identification) access system operates with a passive transponder system. This transponder, e.g. housed in a bank card, a sticker, a label, etc., consists of a chip and an antenna. The chip gets the required current via the antenna from the HF field of the reader. The encrypted data exchange between the reader and the transponder also takes place via the built-in antenna. The distance of the transponder to the reader depends on the transponder size and reader used. Passive operating ranges approx. 15 m. Active transponders operate with batteries and allow operating ranges of up to 80 m. Here, however, considerably larger designs are necessary, too. The unambiguous serial numbers of read-only transponders can be used to identify persons or objects. For this, the serial number is assigned to a person or an object in a database. This comparison can be done against a central database or against a local list. The transponder, e.g. a sticker, which is e.g. attached to a passenger car is detectable with a mobile camouflaged reader over a distance of up to 10 m. When reaching the reception range, the transponder is detected by the reader and respective action can be taken. The surveillance of several persons or objects that were marked with transponders is thus possible in a fully automatic way. The size of the reader is decisive for the operating range. A reader integrated into a USB stick achieves an operating range of approx. 1 m. Inter-linking of the readers with a corresponding software allows simultaneous monitoring of various transponders. It is thus possible to establish complete movement profiles of the used transponders (persons) without any effort and above all inconspicuously. Transponder: various designs, stickers, bank cards, labels, nails, screws, identity cards, etc. The design is co-decisive for the (antenna size) operating range. The larger the transponder, the larger the antenna used = operating range. Power supply via USB up to 470 mA in scan mode and 210 mA in standby mode approx. 1 m operating range for transponders the size of a bank card. Stand-alone unit (36 x 23 x 9 cm) 230 V / 24 V power supply depending on the operating range up to 4 external antennas (50 x 15 x 5 cm). We would like to configure a system meeting your requirements.